An Ordinary Life : Maths: Venn diagrams the fun way! Maths: Venn diagrams the fun way! So yesterday Naomi and Harmonie were sorting out bricks. Harmonie loved it and then it got me thinking what else can we do that's fun and teaches us about maths and that's when I came up with this idea! Some large pieces of paper. We used our size A2 pad and opened it out to use 2 pages. Some building bricks of different shapes or different shaped and coloured buttons are good too. Honi is definitely more of a kinaesthetic learner but she also gets really frustrated when she makes mistakes, rubbers are good but this way is much more fun. Harmonie, age 2, even tried to join in albeit that she needed Honi to show her where everything went! 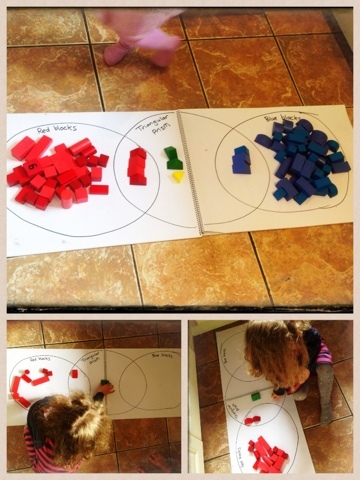 You can decide on what colours and shapes you sort your blocks into; you can chose the colours according to the ones you have in your house and the shapes too. You can of course try this more than once. 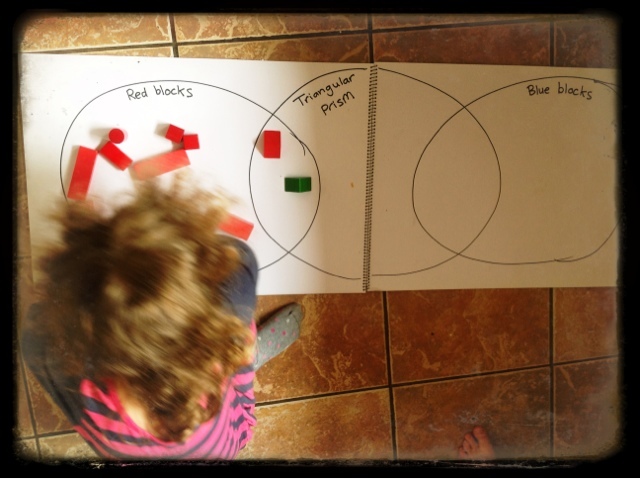 This is how we did ours today: we did blue blocks, red blocks and triangular prisms in the middle but we might try it again another time and do, cylinder shapes, square shapes and green blocks in the middle or green blocks, natural wood blocks and cubes in the middle, the possibilities are endless.